As we discussed in our previous article on One Dimensional array, data was organized linearly in only one direction. Two Dimensional array provides the way to store data in the form of grids and tables. You can think of the two-dimensional array as an array of one-dimensional array. From the figure, you might notice that there are three one dimensional arrays in three rows. Two Dimensional arrays are specified using two subscripts where the first subscript denotes the row and the second denotes the column. As you see, for marks dimensional array there are 6 elements . In generalize term, we can say for arr[m][n] dimensional array, there will be m X n number of elements in an array. How two dimensional arrays are stored in memory ? There are two ways of storing the two-dimensional array in memory. where w is the number of bytes required to store an element, N is the number of columns, M is the number of rows, and I and J are the subscripts of the array element. 1) Does this formual compute the address of row-major order? where, w is the number of bytes required to store an element, N is the number of columns, M is the number of rows, and I and J are the subscripts of the array element. 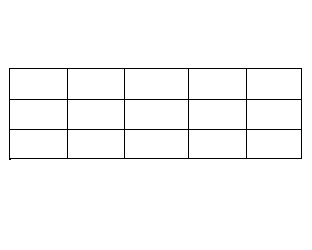 This formula computes the address of column major order. 2) Is this declaration int (*ptr); signifies ptr is an array of pointers to 10 integers? Here ptr is a pointer to an array of 10 integers.